In the BBC comedy series, W1A, newly minted “Head of Values” Ian Fletcher, played by Hugh Bonneville, roams the vast, nomadic space of the BBC’s New Broadcasting House in London, towing a fold-up bike and a thinly-veiled frustration, seeking in vain anything resembling an office in the traditional sense (he ends up constructing one out of bankers boxes). The show is a brilliant send-up of office life in the 21st century, with its middling middle managers and action-itemless breakout sessions, but it’s also a bruising indictment of the design trends that promised more effective, collaborative workspaces. In W1A’s fictional reality, there’s a paucity of desks and an abundance of hay bales (and other weird places to sit). Hapless, ineffectual employees play funny on screen, but in truth, a disengaged workforce is a liability. Workplace design can help boost productivity, creativity and worker wellbeing and you don’t need to be Apple or Google (or the BBC) to do it. According to the latest trend reports, it comes down to providing choice and opportunities for meaningful social interaction. The biggest shift might be in mindset — and metrics. Worker output is no longer the best measure for success, nor a building’s cost per “usable square feet,” but worker engagement, or “collisions per hour per acre,” as some forward-facing organizations are quantifying it, according to a 2014 report by Harvard Business Review. Steelcase, in partnership with research firm Ipsos, takes a closer look at the correlation between worker engagement and workplace satisfaction in its 2016 study “Engagement and the Global Workplace.” Sampling 12,480 participants across 17 countries, the report finds that a third of global workers are disengaged and another third are neutral. Tellingly, those employees most satisfied with their work environment are also the most engaged (of the Canadians surveyed, 11 per cent fall into this enviable category, compared to a 13 per cent global average). The study concludes that workplace design can help, or hinder, worker engagement. Why does this matter? For one, salaries represent a significant cost to employers. According to a benchmarking report citing 2009 figures from the U.S. Department of Labor, 90.3 per cent of the cost per square foot of a corporate office space is spent on salary, the remainder going to rent or mortgage and energy costs. Absenteeism and its shady cousin “presenteeism,” which describes the phenomenon of employees who show up physically but clock-out mentally, displaying low productivity and engagement levels, translates into substantial losses for larger companies. One study, referenced in Interface’s 2015 “Human Spaces” report, estimates that presenteeism costs U.K. businesses £1 billion per year. “Disengaged workers are the largest group of employees in this study,” affirms Steelcase, “which implies that some organizations could be paying well over a third of their employees to come to work and undermine the efforts of the rest of the organization.” Investing in employee wellbeing and overall satisfaction can actually bolster a company’s bottom line. And the built environment, when considered and designed, can relieve common stressors and symptoms of disengagement. If not cost per square foot of usable space, then what? How do you go about measuring, and designing for, the new productivity? Ramtin Attar, a senior research scientist at Autodesk Research, has an idea. A giant in the space of computer-aided design tools and solutions, Autodesk is moving from its longstanding King Street West address in Toronto to a three-storey, 60,000-sq.-ft. showcase space in the MaRS Discovery District. The first phase of the move will commence in January 2017, but a full year in advance, Attar and team began a process of surveys and interviews to glean what was and wasn’t working in the current workspace. They supplemented that qualitative approach with a sensory tracking system, measuring quantitative building performance data including light levels, temperature, carbon dioxide levels and desk occupancy via motion sensors. Attar assures that “good inputs lead to good outputs,” and likens the process to “eating your own dog food.” Unappetizing analogies aside, the collected data has effectively influenced the design of Autodesk’s new workspace, resulting in the creation of unique and diverse neighbourhoods with distributed amenities, “like Toronto itself,” said Attar. Joseph White, director of workplace strategy, design and management at Herman Miller, calls this approach “measuring what matters,” referencing the name of the furniture manufacturer’s 2016 white paper on the topic. And while White acknowledges it is still “early days in the endeavour,” he does point to a general shift away from individual productivity (measured through cost per square foot per person) to an increased emphasis on group dynamics. That’s why Autodesk Research, whose 250 employees, mostly engineers and software developers requiring dedicated space for concentrated work, adopted a unique, computational approach for the design of its new workspace, based in the company’s specific goals and needs. “We really started questioning the notion that there’s a link between open offices and productivity,” said Ramtin Attar. No trend, even those with cultivated mythologies such as that surrounding the open office, is sacrosanct. “Media and popular culture may create the perception that workplaces have changed dramatically in the past decade and that offices are open, informal and collaborative… the reality for employees around the world is that most people work in traditional office environments,” reminds the Steelcase report. That traditional work styles persist and fixed technology dominates mobile is supported through Steelcase’s findings: 60 per cent of employees work in enclosed offices, 33 per cent in open spaces with assigned desks and just eight per cent are nomadic. 80 per cent of employers provide employees with a desktop computer, while 39 per cent use laptops. Even in 2014, Harvard Business Review (in “The Transparency Trap” ) was predicting a pendulum swing back towards privacy, redefined, however, as information and stimulation control and “selective opacities” between teams to increase trust and experimentation within otherwise highly transparent organizations. Acknowledging this diversity and (fairly brilliantly) appropriating the language of natural selection, Herman Miller describes four “office landscape types,” progressing from the legacy model, with blocks of private offices along its periphery, to the fourth and final iteration, featuring greater numbers of group and workpoint spaces. In the Herman Miller-verse there is no single, correct formula for workplace design, just constant, gradual evolution. “The era of eras is over,” said Joseph White. colleagues. Herman Miller calls this “purposeful variety” and suggests that standard (often over-sized and under-utilized) conference rooms transition to different types of meeting spaces, assigned seats give way to “shared workpoints” and privacy-on-demand replace private offices as symbols of hierarchical structures. Professional services firm Deloitte’s new national headquarters in Toronto, designed by London-based architecture practice Arney Fender Katsalidis, is a product and test of these ideas. Boasting 18 different types of workspaces, across 16 floors, 420,000 square feet and connected by a six-storey interior atrium and feature stair, the workplace is envisioned as a “business tool to realize [Deloitte’s] aim of becoming the employer of choice across its myriad business units” and the ultimate flexible space fostering “creativity, innovation and productivity through inspiring common spaces and bespoke work areas,” according to a press release. “Today’s workforce wants more choice and flexibility,” said regional managing partner Ryan Brain at the building’s official opening, attended by Toronto’s Mayor John Tory who commended the 158-year-old company’s willingness to embrace change. But change doesn’t come easy. 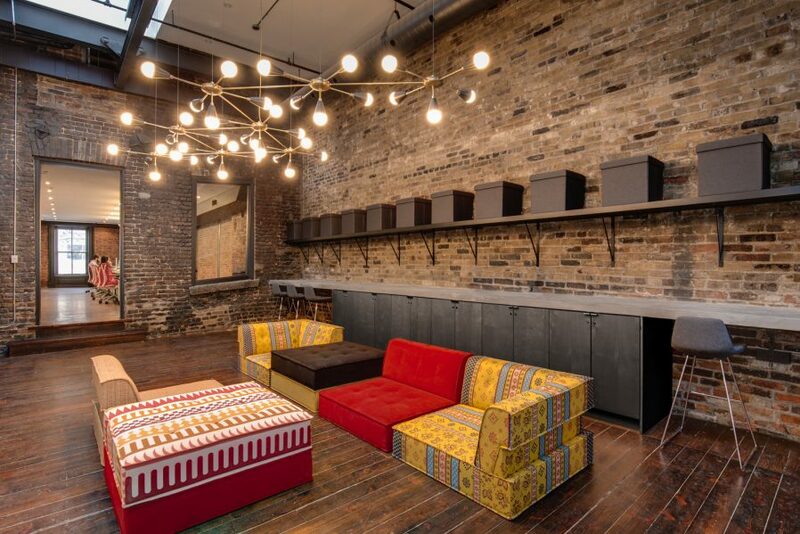 Employees were asked to give up their old ways, consolidating at the downtown Toronto location and giving over 65 per cent of their floor plan to collaborative spaces. Several studies prioritize quality interactions through virtual and physical connections. Herman Miller recommends centralized plazas for broader, “fortuitous interactions” instead of isolated breakrooms that serve niche groups, and the transformation of circulation spaces to “connective spaces” to increase active mixing. 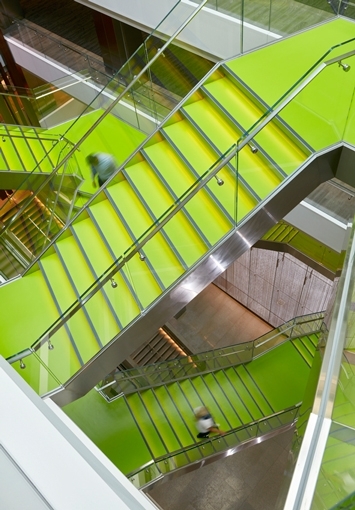 Deloitte’s feature stair works in this way. Because of its central location and generous landings, it serves as both circulatory spine and gathering place. Light and flexible, QuickStand Lite is a new addition to Humanscale’s sit/stand family of products, offering an increased range of motion and a small desktop footprint. Suitable for collaborative and hot-desking environments as well as home offices, it is equipped with a new counterbalance mechanism for transition between postures; an adjustable keyboard and monitor arm platform that provides exceptional stability while typing; and can easily be affixed to existing workstations. Deloitte’s ground-floor bistro at the corner of Yonge and Adelaide streets was an attempt, according to the building’s press release, to “invigorate a neglected corner of the city and interact with the local population.” It fails to do so, remaining inaccessible to anyone without a Deloitte lanyard and sufficient security clearance. Autodesk has aspirations to create a street-facing showcase of its products and solutions; a host space that will feature public events, lectures and hackathons, similar to its San Francisco flagship. Whether they’ll succeed in weaving into the city fabric — or, at the very least, into the MaRS community of startups, multinationals, researchers and investors — remains to be seen. Barring a new season of W1A, we’ll be watching. 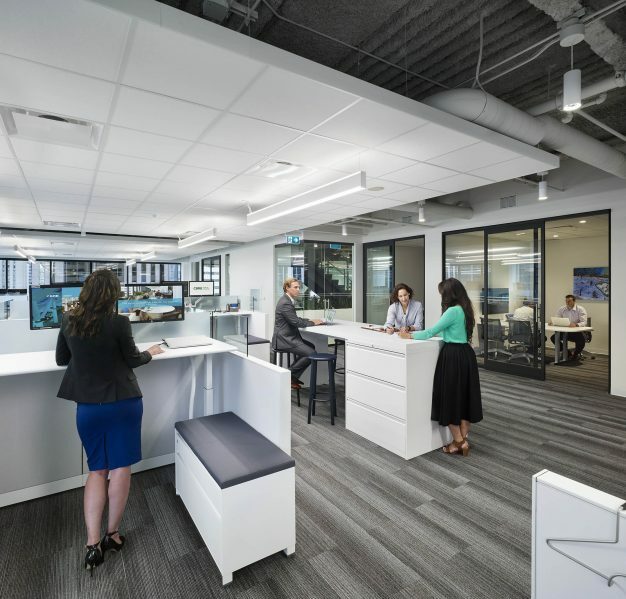 According to a 2015 study released by Interface, titled “Human Spaces: The Global Impact of Biophilic Design in the Workplace,” 47 per cent of workers report no natural light and 58 per cent no access to plants in the workplace, which makes biophilia, a concept popularized by biologist and naturalist E.O. Wilson in 1984, all the more relevant. More than trend, maybe closer to a movement (certainly to its proponents), biophilia supports the innate relationship between human beings and nature. For the design of work environments, that means potted plants and views, configuring space for greater degrees of openness and, if nothing else, the integration of reasonable facsimiles, which, remarkably, can stimulate some of the same positive effects. All this is critical for the health and wellbeing of both employees and businesses, says David Gerson, vice president of marketing at Interface, citing a University of Oregon study that found that quality of view was the primary predictor of absenteeism. 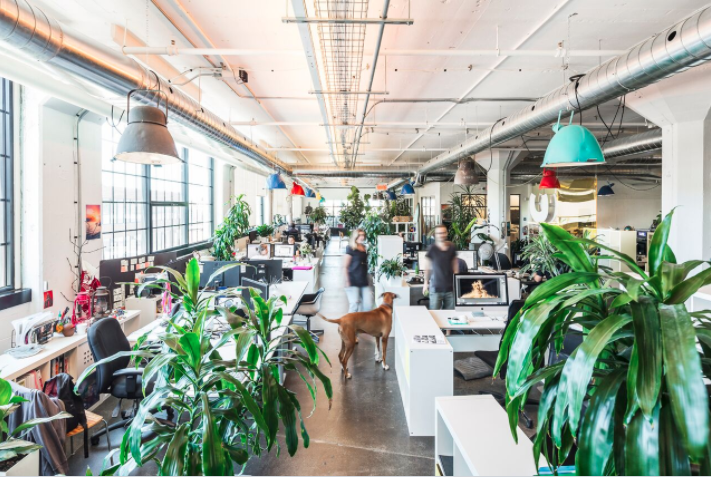 At a time when companies “are interested in wellbeing but have no idea how to implement it” and human resources managers are looking to attract and retain talent, the relatively low-fi and actionable strategies proposed by biophilia are “music to their ears,” says Gerson. Studio TK offers contemporary office furniture to the corporate, hospitality and academic markets. With an exclusive focus on social applications, Studio TK introduced a number of new products to its Infinito, Cavu, Envita, Cover, Qui and Fractals collections at NeoCon. Influenced by the growing demand for social settings in the workplace, these collections offer residentially inspired products that help bridge the gap between task-driven and culture-driven workspaces.